Wales’ highest mountain dominates the landscapes of mid-north Wales and the counties of Gwynedd and Conwy. But this unyielding mountain range, which peaks at 1,085m (3,560ft) is not only for hardy adventurers. Much like Welsh hospitality, the tracks up and down Mount Snowdon are plentiful and appealing to a wide range of visitors. As Yazz once sang: “The only way is up…” and if you’re heading for the summit you’ll need more than one 90s one-hit wonder to gee you along. But there are six routes up the mountain with a Sherpa bus service connecting each of them at the base enabling you to go up one way and down another, and still get back to your car or accommodation. The Llanberis Path departs the pretty village of Llanberis and remains a pony path. Though tourists are no longer ridden up the mountain by mule (not to say you won’t wish for it at some point on your trek). Pyg Track is one of the shortest routes up Snowdon at just over 3 miles to the summit and perhaps the most well known. One of the spectacular views on a clear day is across to Llyn Llydaw and Llyn Glaslyn. You won’t spot any pigs en route, ‘pyg’ in Welsh’ is black tar, which could have been carried from the nearby copper works along this path, but the origins of the name of Pyg Track remain unclear. Miners Path was built to carry copper from those same copper works. So keep your eyes peeled for remnants of mining history along the path. All three of these routes start from the Pen y Pass car park in Llanberis. Miners cuts between the two lakes that can be seen if you take Pyg. The Snow Ranger path starts close to the youth hostel of the same name near Llyn Cwellyn. The path is named after the self-titled ‘Snowdon Ranger’, John Morton, who guided tourists to the summit via this route in Victorian times. Watkin Path has political connections. It was named after Sir Edward Watkin a politician and railway entrepreneur then opened in 1892 by the prime minister of the time, William Gladstone. The route passes the slate quarry (there’s a hint at your surrounding geology) and a boulder now named after Gladstone (who wouldn’t want a boulder named after them…). Rhyd Ddu Path is less pronounceable than its original name of Beddgelert Path. This is a route that once started in Beddgelert and was the path first used to ascend Snowdon in the 17th century (and you’re anxious about attempting it now with all your 21st century garb…). Nowadays it is one of the lesser known routes (in other words take this route if you don’t fancy summer crowds) and is said to be just a bit more demanding than Pyg. This mountain is as diverse as our 90s music collection, so don’t miss the chance to follow one route up and another down. The very fact that there’s a train available to scoot the less fit or able up its slopes is emblematic of a nation’s desire to share their geographical icon with as many visitors as possible. 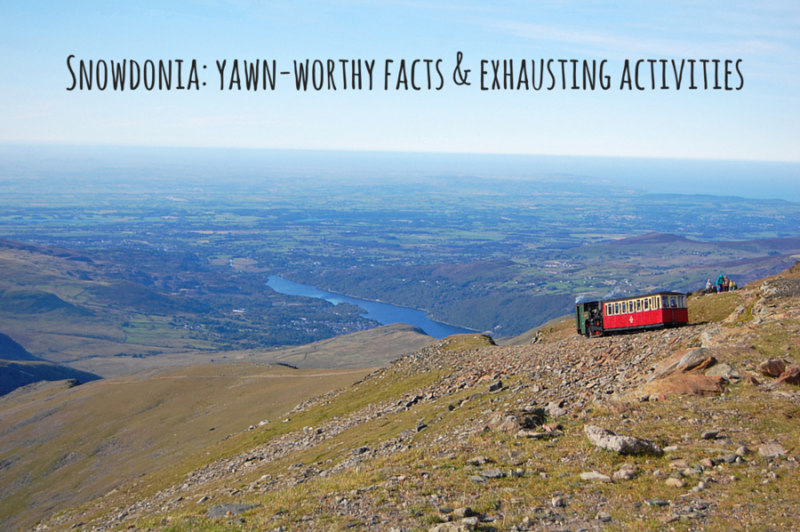 And so the Snowdon Mountain Railway scales this Welsh spectacle with the Hafod Eryri station and visitor centre perched near the summit – there’s a cafe (hurrah!) and a gift shop (there’s always a gift shop) open between late spring and the end of October. Snowdonia is visually stunning and as physically challenging as you wish to make it. Yes, the weather can be unpredictable (the name Snowdon originates from Saxon times and means “snow hill”), but there are tea rooms aplenty to warm your cockles and alleviate any dented prides! And Betws y Coed is one of our favourite destinations in the region combining both of these things. Nestled in the Gwydyr Forest between Corwen and Capel Curig, it’s a veritable Welsh delight with its tumbling river, valley weather and waterfalls (yes, plural). For the latter you don’t even have to leave the village as Pont y Pair Falls cascade alongside a 53-hole rock cannon. The rather more famous Swallow Falls on the outskirts of the village is more a network of waterfalls said to produce foaming water. In terms of accessibility, it doesn’t get much better – there’s a train station in the village on the line from Llandudno. Otherwise the A5 trundles through one of its most spectacular settings yet. But trains mean there’s also a railway museum and an extensive miniature railway for those rainy afternoons before scones, jam and cream (and maybe a smidge of creamy Welsh dairy butter). All your equipment and gear requirements are covered by a range of independent and known-brand stores whose staff are all Snowdonia-experienced. There are mountain biking tracks from the village, walking paths are plentiful and if you get up and above the village you’ll discover mountain lakes and the occasional erroneously planted Christmas tree. On your way out of town towards Capel Curig (great pub there, by the way), you’ll pass (or stop at) The Ugly House – it’s not the cutest of cottages in Wales but still the Snowdonia Society maintains it. And it’s right by a turning that winds (literally) up to one of the mysterious mountain lakes. Wales’ most unexpected icon is the Italianate village of Portmeirion. Created by the same man, Clough William-Ellis, that created the first all-in-one building at the summit of Snowdon, this is more folly than function at play. On a beautiful expanse of Welsh coastline, one man’s vision for the perfect seaside village is a mix of Italian architecture, pastel facades and tropical landscaping. For those fans of 1960s TV series, it was most famously the filming location for The Prisoner and has also been used for scenes in Doctor Who. Weathered and a little worn nowadays, it is still a sight to behold. Memories of childhood Welsh holidays loom when anyone mentions the slate caverns near Blaenau Ffestiniog. Yet this place plays homage to another of Wales’ industries of times gone by. However scorchio it is outside, you’re about to descend 500 feet, so bring that fleece (it’ll look better with your hard hat than your pashmina). Part of the experience here is the descent in Europe’s steepest mining cable railway. Then let your imaginations free contemplating life underground with just torchlight and the interior of craggy mountainside – not for the claustrophobe or acrophobe. Wales is proud of its heritage and Wales’ woollen mills are now few and far between. Trefriw near Llanrwst applies another of the region’s greatest assets to power some of its production. Hydro-electric turbines work alongside hand-spinning masters to produce traditionally woven fabrics, garments and furnishings. Its gardens contain plants that the mill uses to provide natural colours for dyes as well as for fibres and textile tools. Stop for a demo of rag rug making or buy a piece of Welsh heritage from this 150 year old mill. Then naturally make your way to the tea room for the trickiest choice of the day: bara brith or Welsh cake? When I first visited this clever place I was a rather unenamoured six or seven year old on a grey, cold Welsh day. But in the 80s this place really was quite futuristic and environmentally smart – it just didn’t look it. Reflective of Wales’ appreciation for its abundance of water – the Welsh have been using water to generate power for over a century in some places – nestled in the hills between Machynlleth and Dolgellau, it’s perfectly placed for hydro-power innovations. The Centre for Alternative Technology brings the sustainability thought process together in one easy to understand school project. And its modernisation since my first visit makes it not just a showcase for how to be green, but also a fun place to discover the latest energy generation innovations. I’ve spent a lot of time in Snowdonia over the last three decades and I keep going back for more. The sleepy villages are resurging with their take on cafe culture. The pubs cook enviably heart warming food. The pride in Welsh produce is in full bloom with signs luring you not to leave Llangollen without picking up half a lamb for the freezer back home (best value Welsh lamb you’ll find anywhere). And the freshest of mountain air leads on to some of the UK’s most spectacular beaches. Snowdonia – a region you won’t want to leave.